Creativity is a hallmark of humanity and our very evolution; no one person is not creative, merely some are just more than others. The level of creativity you engage with can shape how we see the world around us, for the better. However politics, by its very nature, systematically impedes many critical factors in being creative. 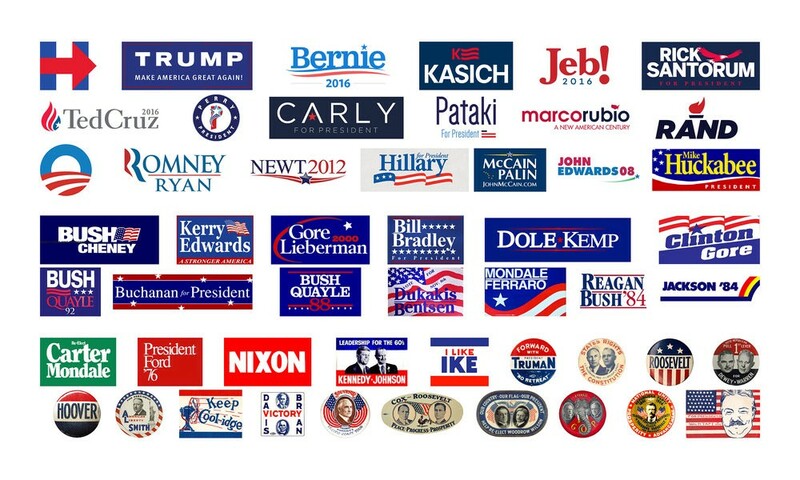 Identities for presidential campaigns over the years. The government, as it stands now, craves definition, straightforwardness, and identity; there’s a minimal grey area in legislation. But creativity feeds on the undefined and yet known. Sociologist and physiologist alike share the belief that, ironically enough, creativity is often the step to gaining a more significant a sense and understanding of the world around us. Now fully cemented in the 21st century, it’s becoming clear that creativity will be the catalyst to solving some of the world’s most pressing issues. From cleaning up our plastic ridden oceans to reworking the healthcare system, creativity — with a capital “C,” all-encompassing and not niche specific — is our secret tool to moving civilization forward. But the way politics can impede the creative process is staggering, and by no means doing us any good. Let’s take a step back and go over reasons as to why those two statements are true. Like we said earlier: Creativity thrives in uncharted waters. But politics couldn’t be more different, requiring vast amounts of perceived, defiant knowledge to take a stance, any stance, on an issue. This meticulous attention to painting the world either white or black creates “analysis paralysis.” It’s a terrible state of mind for creativity, rendering the human brain unable to stick to efficient processes due to information overload. This high-level of overthinking has been documented to increase stress and mental fatigue, which, regardless or not if you’re embarking on a creative endeavor, isn’t helping anyone. In the United States the arts, perhaps the pinnacle representation of creativity in our culture, have been relentlessly attacked over the past decade in school systems, viewed as an unnecessary budgetary expenditure. The current administration has gone to defund many art programs across the country, including NEA (National Endowment of the Arts). Public schools, specifically — which are heavily influenced by local, state, and national governments — are incredibly political, to boot. School board seats are filled with voted upon members, district-level budgets and curriculum go through committee hearings, all of which is to say that the school systems are, in many ways, as political as Washington. Political posturing is stripping the classrooms of creativity. And robbing people of creative expression can (and will) affect Americans for generations to come. Politics is becoming increasingly focused on corporation contributions and other large-scale donations from the private sector. That, and lobbyists are investing more time and money to garner political gains. So, yes, politics is now entirely commercial — which leaves us creatively bankrupt. Historically, most creative ventures never started off as profitable. Why do you ask? Because beginning virtually every creative venture involves thinking outside the box and that latter-mentioned box is usually quite valuable. But as iterations of that creative idea are fine-tuned and honed, seldom do they not become better the original. This is how products are bettered, problems are solved, and the world, as a whole, progresses. We can all agree our planet is in urgent need of creative problem-solving measures. In politics, it’s vital people, the voting public, are defined and, in some ways, looked at as one governed entity. However, creativity is choked in one-note, single-sided communities. Diversity plays an enormous role in creativity. Cultural diffusion — the exposure to different people, ideas, and beliefs — results in significant spikes in creativity. The current smartphone market is an excellent example of how cultural diffusion can rift across the world, with big-name tech companies taking cues from one another, be them in Japan, China, or the United States. By embracing our neighbors — regardless of race, gender, sexual orientation, or political affiliation — we foster creativity, not destroy it. Now, if only politics worked in that way, perhaps we’d all be better off. Researchers who study creativity note that both empathy and altruism play a vital role in creativity. People in environments — like workplaces, for example — where acts of kindness, community connection, and acceptance are commonplace show higher levels of creativity than those occupying more apathetic, unkind places. Who knows: if Washington was a loving place, maybe we’d seen an uptick in creativity from all branches of government. Politics is, among other things, a game of puffing-up chest and trying to seem more significant, smarter and better than the other side. But true creative endeavors are entirely original — and absent of egoic comparisons. When we compare ourselves with others, we rob ourselves of our unique innovations and imaginations. So, create your own standards of creativity that are solely yours, and allow yourself to create in all manner of ways you seem fit. The world will be better off because of it. As Dr. Brene Brown, a researcher of empathy and creativity at the University of Houston and TED talk maven herself has repeated time and time again: “Vulnerability is the ultimate form of courage and is a gateway to creativity.” When was the last time you heard a politician be openly, painfully vulnerable? From healthcare reform to disaster relief, distraught Americans often sit in limbo, waiting for concrete results and actions to happen that’ll help their current situations — despite immediate promises made from high-ranking politicians. However, if those in office were willing to be a bit more vulnerable (and honest) with the greater public, perhaps they would finally find the solutions to shorten the long list of problems. Ask any artist, poet, or even tech-savvy entrepreneur, and the vast majority will their best creations came when they could create freely. Politics, to the contrary, operates on a very stringent set of formalities and protocols; the two processes couldn’t be more different. Studies show that creativity thrives in situations where people aren’t expected to follow any set rules or guidelines. When participants in these same studies were allowed to think and ideate without borders, they came up with truly original ideas and solutions, many of which couldn’t have existed within the parameters mentioned above. And even when creative concepts do find their way onto a ballot, they have to then go through the woodchipper that is bureaucracy. In a flash, those same ideas that were once revolutionary in their thinking can be struck down by a single vote. It’s a vicious cycle of creation and repression, one it would be wise to stop right now. As far-fetched as it might seem, bringing high-level creativity back into politics is possible — because it once existed there. America’s Founding Fathers are a great representation of just how creativity can give birth to not only profound change but whole nations themselves. There’s one founding father, in particular, who sticks out above the fray, proving that boundless creativity and political savviness can go hand-in-hand: Benjamin Franklin. The celebrated Pennsylvanian famously engaged in both art and science projects when he was stagnated in his political workings. A serial entrepreneur, he invented the Franklin stove, the lightning rod, bifocal lenses, and the glass harmonica, the latter of which were used by Mozart and Beethoven to make music. He, too, measured the force of the Gulf Stream, built ships, followed storm paths, and wrote a theory of energy absorption that was later used to develop electrical grids. And he took all that creativity to craft policy. Franklin is the only man who helped create all four documents that gave birth to the American republic, his signature appearing on the Declaration of Independence, the Articles of Confederation, the Treaty of Paris, and the Constitution. To, truly, better the American society, Americans have to start getting creative. They have to be open to the idea that vulnerability will lead to grand new plans of action, policies, and much more. They have to think and ideate outside the box — because, frankly, governing from the confines of that metaphoric box isn’t going over too well for the American nation. Push politicians, no matter which side of the aisle they may sit, to be vulnerable. Let your stance be known: engaging in creativity is imperative to not only our well-being but successful governing as a whole. Here’s hoping we’ll all, the world over, be looking toward a more politically open and creative horizon, sooner than later.